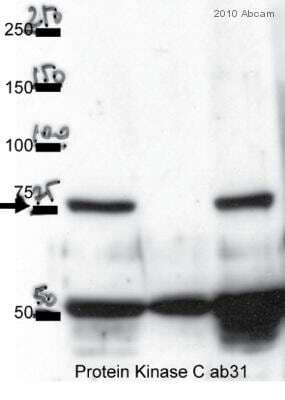 This antibody reacts with PKC alpha, crossreactivity to PKC beta isoformes can be observed. WB: Calpain treated PKC. Rat adipocyte homogenate. 3T3-L1 homogenate. 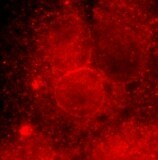 Purified microsomes from 3T3-L1 cells. Flow Cytometry: Jurkat cells. ICC/IF: Vero and HEK-293T cells. IHC-Fr: mouse spleen and duodenum tissue. IHC-P: Human skin papilloma tissue. It should be possible to selectively block degradation of PKC without affecting the membrane associated activation. This will allow an assessment of the role of proteolysis in the activation of the protein kinase pathway. Our Abpromise guarantee covers the use of ab31 in the following tested applications. Cytoplasm. Cell membrane. Mitochondrion membrane. Nucleus. Review by Mikael Rutberg submitted 2 September 2004.
ab31 staining PKC in human skin papilloma tissue sections by Immunohistochemistry (IHC-P - formaldehyde-fixed, paraffin-embedded sections). Tissue was fixed with paraformaldehyde and blocked with 10% serum for 1 hour at room temperature; antigen retrieval was by heat mediation in citrate buffer. Samples were incubated with primary antibody (1/100 in PBS) for 8 hours at 4°C. A biotin-conjugated Goat anti-mouse IgG polyclonal (1/1000) was used as the secondary antibody. ab31 staining PKC in mouse spleen and duodenum tissue sections by Immunohistochemistry (IHC-Fr - frozen sections). Tissue was fixed with paraformaldehyde and blocked with 5% serum for 1 hour at room temperature. Samples were incubated with primary antibody (1/500 in PBS) for 8 hours at 4°C. An Alexa Fluor®488-conjugated Goat anti-mouse IgG polyclonal (1/1000) was used as the secondary antibody. Nuclei were stained by DAPI. Overlay histogram showing Jurkat (Human T cell leukemia cell line from peripheral blood) cells stained with ab31 (red line). The cells were fixed with 80% methanol (5 minutes) and then permeabilized with 0.1% PBS-Tween for 20 minutes. The cells were then incubated in 1x PBS / 10% normal goat serum / 0.3M glycine to block non-specific protein-protein interactions followed by the antibody (ab31, 1 μg/1x106 cells) for 30 minutes at 22°C. The secondary antibody used was a goat anti-mouse Alexa Fluor® 488 (IgG; H+L) ab150113 at 1/2000 dilution for 30 minutes at 22°C. Isotype control antibody (black line) was mouse IgG2a [ICIGG2A] (ab91361, 1 μg/1x106 cells) used under the same conditions. Unlabeled sample (blue line) was used as a control. Acquisition of >5,000 events were collected using a 20mW Argon ion laser (488nm) and 525/30 bandpass filter. This antibody gave a positive signal in HL-60 (Human promyelocytic leukemia cell line) cells fixed with 4% paraformaldehyde (10 minutes)/permeabilized with 0.1% PBS-Tween for 20 minutes used under the same conditions. 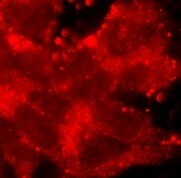 Vero cells with ab31 at a 1/50 dilution. HEK-293T (Human epithelial cell line from embryonic kidney transformed with large T antigen) cells with ab31 at 1/50 dilution. 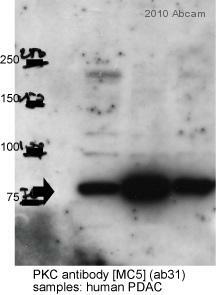 Do you have any information whether this antibody does recongize other isoforms of PKC? Can you please confirm which isoforms of PKC have been tested as well? 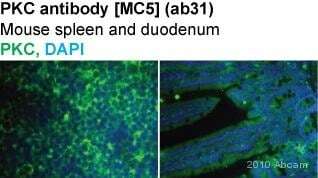 Indeed, this antibody is a clone and is used by many researchers. However I could not conclude on its specificity. Indeed, some sources quote that this antibody is specific for PKC alpha, whereas other state that there might be crossreactivity with PKC beta isoforms. In summary: we can guarantee that this antibody will recognize PKC alpha, we can however not exclude crossreactivity with PKC beta isoformes. Please do not hesitate to contact us should you have any questions or concerns. What type of tissue is recommended as a positive control for IHC-P? Thank you for your enquiry. 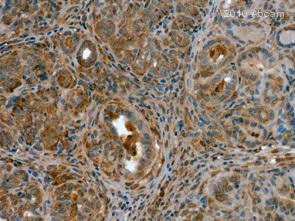 For ab4127, this antibody was validated on tPA induced myeloid cells for IHC. Also, melanocytes have been known to express PKC alpha and alternatively brain tissue is typically inherently expressive. For ab31, I regret to inform you that this antibody has not yet been tested for application in IHC. I have updated the online datasheet to reflect this, and apologize for this. Please contact us again if you have any additional questions or concerns. 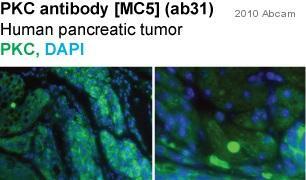 Could you tell us which PKC isoform(s) would your PKC antibody [MC5] (ab31) recognize? We are interested in using immunofluorescence to determine the spatial distribution of PKC alpha. Do you suggest any other Ab? I apologize for the delay in responding to your enquiry. The originator of this antibody attests that this antibody has been found to recognize Protein kinase Ca. Epitope: within the variable region V3 PKCa (the site of limited proteolysis on the native enzyme). 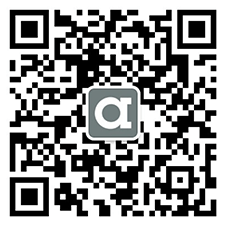 If you require further information, please contact us again and we will gladly assist you. any suggestions for a range of dilutions for Western blot? We have no information about the dilutions originally used with this antibody. I would suggest trying the antibody at 1:1000, 1:250 and 1:2000 initially, the ideal dilution will depend on the details of your experiments.